Oh okay, so it looks like Mimi Faust may have really came through for Tiffany Foxx. 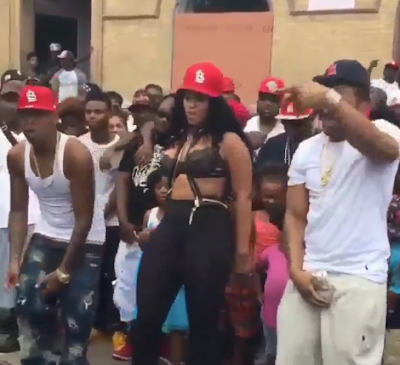 The rapper posted a clip on her Instagram of a video shoot in St. Louis alongside Nelly. The Foxx is wearing typical thot-ful attire of a bra top and some high-waist shorts while rapping about guns, drug lords and some other garbage. I cannot stand/understand why rappers insist on having little kids in the background of these ratchet music videos. I understand they're probably family members or kids from the neighborhood, but dammit, stop exposing the babies to this nonsense! What do you think of Love & Hip Hop Atlanta's Tiffany Foxx's sneak peek at her music video featuring Nelly?